Not to sound like a broken record, but it's been busy as I crash course myself on Inventor and Showcase R2010. As a result, my blogs have been a little weak. Nevertheless, here's a Showcase 2010 tip. As I continue on my Showcase Adventures, I've learned a TON of things about creating compelling images. I have to thank all those who've taken time out of their day to teach me. I wouldn't be as far as I am without them. One of the things I've been working with lately is ray tracing. If you're not familiar with what raytracing is, it's the process of 'tracing rays' (well 'duh'!). In essence, you're tracing the rays of light as they bounce from one object to another. In this process, you'll see things like objects reflecting in other objects, and refraction of light passing through glass or another transparent material. You can toggle it on or off by hitting 'R' on the keyboard. 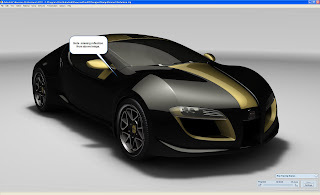 But there's been a challenge in Ray Tracing that R2010 addresses. When you raytrace in R2009, there's no way to tell if the ray tracing has finished it's calculation other than just your eye. Which, isn't always the best. Since raytracing can take a few minutes to calculate, a way of being able to tell when ray tracing is finished would be great! 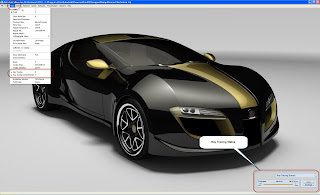 In R2010, you can hit 'Y', or go to View>Ray Tracing Control Panel to turn on the control panel. Here's an image that shows where to get it! Here's a Hardware (standard) rendering image for comparison. Note that in this image, you can't see the reflection of the side view mirror in the fender (like you can in the Ray Traced image above). Happy start to the new week! Looking for a job? The checkout the Autodesk Assistance Program HERE for free educational software and training to keep your skills sharp and up to date! Sometimes, it really is that cool!